When we first went gluten-free around our house, coconut macaroons were the first cookie I experimented with and successfully adapted. They are a quick go-to cookie for me and are perfect for a holiday party, but taste good any time of the year. This particular recipe was given to me by a co-worker a few years ago. She brought them in a couple of times and I loved them. I honestly don't know what cookbook they come from; I just have a xeroxed page. One reason I love the recipe is that it calls for whole eggs. 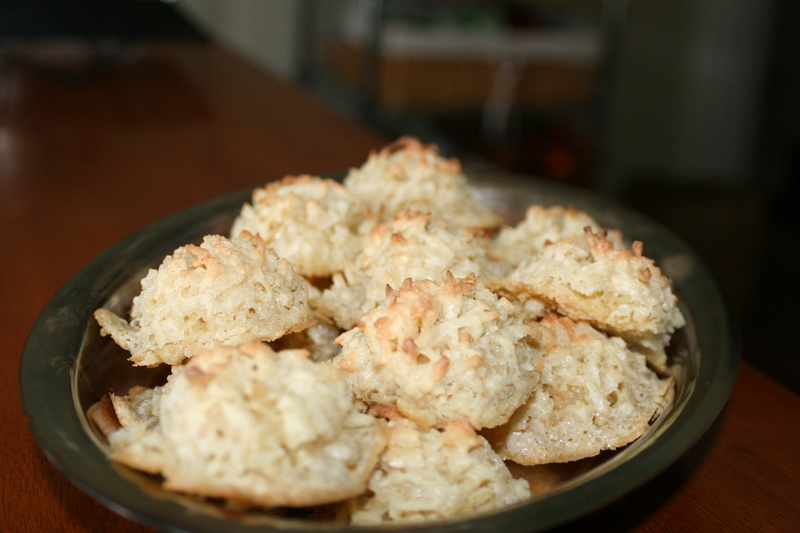 Most coconut macaroon recipes call just for egg whites. Also, I usually decrease the sugar by at least 1/4 cup because I tend to like my baked goods a little less sweet. Place rack in the center of the oven and preheat to 350°F. Grease an insulated baking sheet (or use two baking sheets, stacked on top of one another). In a medium bowl, whisk together the eggs, sugar, salt, flour, and vanilla extract until well blended. Stir in the coconut. Drop the dough by 1-Tbsp mounds on the prepared sheet, spacing them at least 2-inches apart. Bake for 14-16 minutes, until they are golden brown around the edges and a few strands of coconut on the tops of the cookies start to turn golden. Cool completely on the baking sheet on a wire rack. Makes about 36 cookies. Note: These are best eaten the day they are made, but will keep up to 2 days in an airtight container. having tasted these when you've made them, i can vouch for their deliciousness! :) love this recipe.